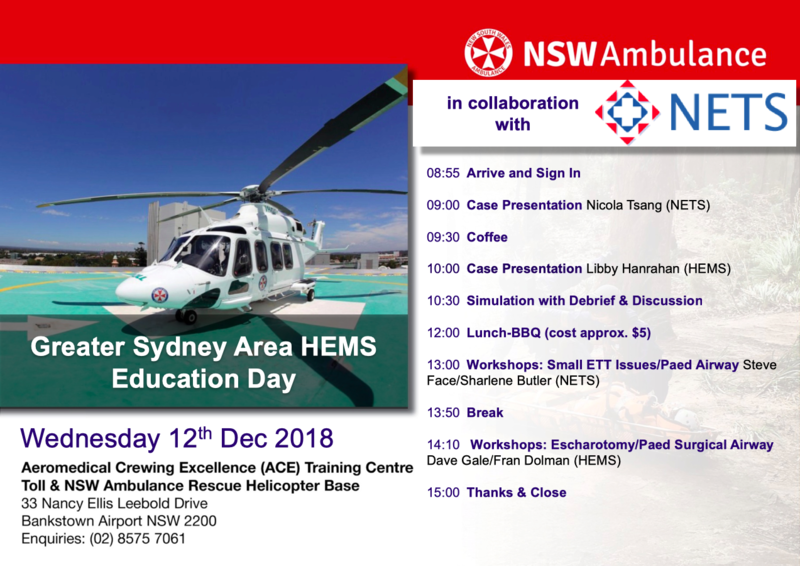 Airway Registry learning points reflect the challenges described and wisdom shared by Sydney HEMS personnel and guests at the Clinical Governance Airway Registry presentations for July 2018. Cases are discussed non-contemporaneously, anonymised and amalgamated over a time period to draw together unifying take-home messages. Details of specific cases are removed and/or changed, such that any similarity to real-life patients or scenarios is coincidental. These stills are taken from CMAC footage of a prehospital patient – see how lifting the epiglottis directly has improved the view of the tracheal opening. You might remember this technique from our earlier video “Mac as a Miller”, which demonstrates how scooping the epiglottis with the Mac blade – as you would intentionally with the straight Miller blade – does not preclude intubation and may improve your chances in event of a grade II-III view. 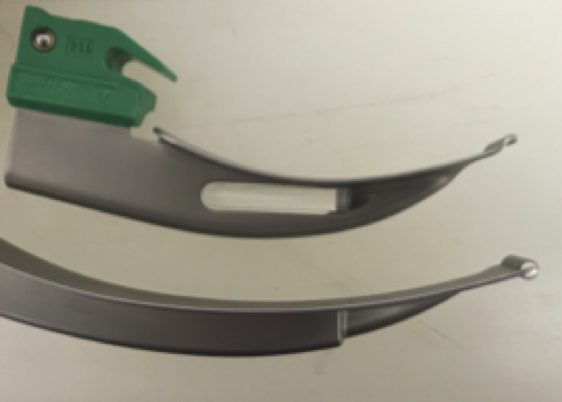 As in our video focus section for May/June‘s clinical governance day, we were reminded that lubricating the laryngoscope blade can be particularly helpful for interhospital missions where patients often have very dry tongue mucosa from non-invasive ventilation or general dehydration. Intensivists present at CGD admitted they routinely lubricate a laryngoscope blade. We don’t think this point ever makes it onto an ‘airway assessment’ list but it should; keep it in mind. Here’s that double-learning-point video to remind you. Trying to get a bougie to pass into the trachea can be a very frustrating experience. Practice can help – to aid us in identify when curving (or other manoeuvres to move the bougie tip anterior) are necessary, and to practice the ‘feel’ of rotation for moving the tip right to left. Try practising laryngoscopy on a manikin and intentionally touching different parts of the laryngeal structures with your bougie tip to practice that control. Remember to practice with gloves & safety glasses on! We discussed two videos. In the first, there are significant facial injuries. A gloved hand just visible providing good mouth opening – note how despite facial injuries, the larynx is quite identifiable and not flooded with blood. In the second video, there are pooled airway secretions. You can see clear secretions filling the NPA visible in pharynx. As mentioned in the May/June post, we carry a blue coudé tip bougie and a white straight bougie. During this intubation, it was noted by the team member watching the screen (VL) that the approach of the white bougie caused a significant change in the screen image brightness, which dulled the view of the larynx in the background by comparison. In the same patient the blue bougie had much less effect and the view of the larynx was maintained, allowing intubation. Presumably this is the CMAC camera auto-adjusting for brightness in the visualised field on the video screen, so not an issue when using the CMAC for DL – but it is worth considering as a sudden reduction in illumination at the point of intubation could be most unhelpful when using the CMAC VL! We intend to discuss this with Storz, the manufacturer of the CMAC. In this video, a team member is providing external laryngeal manipulation in an attempt to improve the view at laryngoscopy which is released after bougie insertion. Note how on release of ELM, the cords appear to open wider. Care should be taken with any ELM (or cricoid, when used) to avoid closing the cords and making laryngoscopy more challenging. 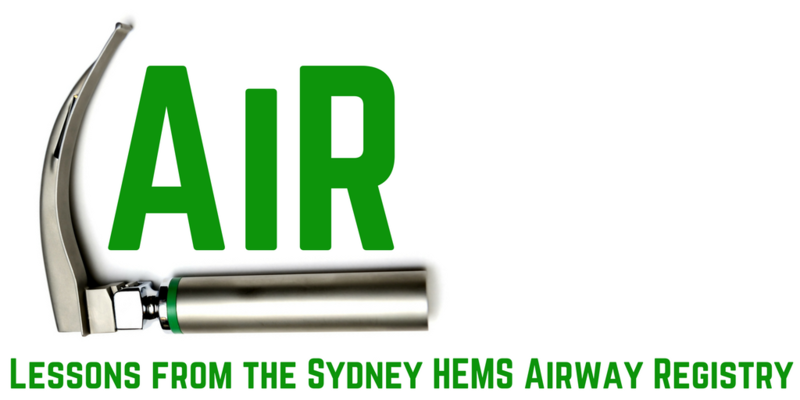 Airway Registry learning points reflect the challenges described and wisdom shared by Sydney HEMS personnel and guests at the Clinical Governance Airway Registry presentations for May & June 2018. Cases are discussed non-contemporaneously, anonymised and amalgamated over a time period to draw together unifying take-home messages. Details of specific cases are removed and/or changed, such that any similarity to real-life patients or scenarios is coincidental. In May we reviewed some videos to talk about how our intubation equipment – bougie or ETT – can get stuck, and what we can do about it. This patient has been exposed to fire/flames with a presumed inhalational injury – note sooty secretions and swollen arytenoids/posterior glottis structures. We can see the blue (coudé-tip) bougie passes the cords but following that there is resistance to further advancement – seen as the glottis being moved by attempts to advance the bougie. The team remove the blue bougie and use the white bougie which is less curved. The coudé tip is likely impacting on the tracheal cartilages of the anterior tracheal wall. 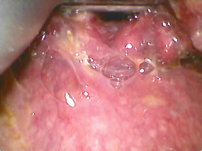 This is more common with hyperangulated video laryngoscopy but occurs here with a Mac shaped blade. Exchanged the coudé-tip bougie for a straighter bougie (as was done here – we carry a non-coudé-tip white bougie in addition to the blue bougie). We use Parker Flex-TipR ‘GlideRiteTM’ tracheal tubes to reduce the potential for the leading edge of the endotracheal tube to ‘catch’ on glottic structures while railroading over a bougie, as is classically described for the arytenoid cartilages. This video shows the gap that can exist between bougie and ETT tip that could lead to ‘catch’ (risking failure to advance and laryngeal trauma). This CMAC video is a great example of how the oesophageal inlet can look a lot like a trachea – re-emphasising the need to see arytenoids cartilages in order to positively identify the trachea prior to passing a bougie or ETT. A medical cardiac arrest can present healthcare workers with an airway flooded with gastric contents. Such soiling can be particulate and thick which can block common Yankauer suckers. A work-around can be to remove the blocked Yankauer sucker and simply use the end of the suction hosing itself. The hosing is a much larger diameter and is often very successful at clearing the pharynx when used directly. Be aware that small portable units may have a volume capacity that can be easily exceeded by large volumes of soiling; vehicle-based suction units have a larger capacity. At Sydney HEMS we carry a longer suction tubing set so we can connect to the in-ambulance vehicle suction while intubating at the back of the ambulance. Patients who have spent some time prior to intubation breathing non-humidified wall O2 (for example, via a non-rebreathe mask) can have very dry mucosa in their oral cavity on airway assessment. An assessment of the dryness of oral mucosa is not classically part of a pre-intubation airway assessment but it can cause issues, so it is important to notice. Pre-lubricating the blade can make the laryngoscopy much easier; lubricating gel can be Lseen on the blade in this video. Initial attempts to intubate this patient were made using a direct laryngoscopy technique. During DL, the operator struggled to identify the inter-arytenoid notch landmark. The intubator proceeded to use the video screen (VL technique) which gave them a clearer view of the glottis and allowed placement of the bougie. It became evident that a sputum plug was obscuring the inter-arytenoid notch landmark that the operator had been trying to visualise. Having the back-up of video laryngoscopy on this Mac 4 blade intubation was very useful.